Here at Market Harborough Art Club, we are pretty much 'hands on' at our monthly meetings. 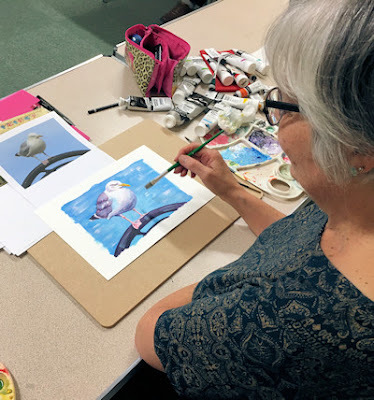 Our June meeting was very much in that vein, with David Coleman leading our group to paint a Seaside Scene using A5 size paper or card. Most of us managed to end up with a somewhat finished piece, though some took theirs to finish at home. The idea of the topic is that David will take the finished works and mount them in a display to show at our forthcoming exhibition in October, after the success of our composite image displayed last year attracted quite a bit of interest from visitors to the exhibition. If you are wondering what we will be getting up to at our next meeting, do have a look at the programme page on our website.